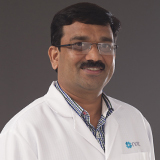 Dr. Prashant completed his MBBS in 1994 and Master’s Degree in ENT in 2001 from Rajiv Gandhi University. He worked in Jawaharlal Nehru Medical College, Belgaum as a Professor of ENT where he attended outpatient clinics, performed various ENT surgeries. He has many international and national publications to his credit and has participated in various international, national, zonal and state level workshops to train himself in the field of ENT. Dr. Prashant has vast clinical expertise in Ear Surgeries like Grommet insertion, Tympanoplasty, Mastoidectomy, Stapedectomy, Canaloplasty, Preauricular sinus surgery, Nose surgeries like Endoscopic Sinus Surgery, Septoplasty, Submucosal Resection, Turbinoplasty, Rhinoplasty, Throat Surgeries like Adenotonsillectomy, Microlaryngeal surgery, Thyroid surgery, Submandibular gland surgery and Thyroglossal cyst surgery. He has special interest in Microscopic Ear Surgery and Endoscopic Sinus Surgery. He can speak fluent English, Kannada, Marathi and Hindi.